All my books are listed on the menu. Some are available now and a few are in transition. That means they were Kindle World novellas and are being rewritten and will soon be reposted and available—at a lower cost. I’d love for you to sign up for my quarterly newsletter. I like to cook, so there’s always a new recipe and every quarter two people get a $5 Amazon gift card to spend on e-books. My blog is generally weekly and is about cruising through life with all its fun, trials, and quirks. Your information is never shared and you can unsubscribe at any time. 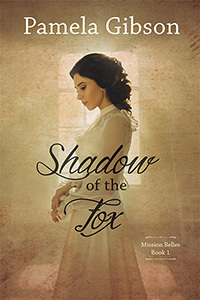 In my new release, Shadow of the Fox, I am going back to my roots. I grew up in the small mission town of San Juan Capistrano and my first books were non-fiction histories of this town and others in Orange County, California. My inspiration for some of the scenes in my novel are actual buildings and people who lived there during the pre-gold rush era. Check out the blurb on the Books page. The war between Mexico and the United States set everyone on edge. Be sure to watch for the new Netflix series produced by Shonda Rhimes airing in 2019 on this very subject. Working title is Pico and Sepulveda. “Pamela Gibson has written a heartwarming tale about love, loss and compassion, and this enduring tale of lost love will tug at the reader’s heartstrings.” Read full review in the 2017 December issue of InD’tale Magazine.